It's official. 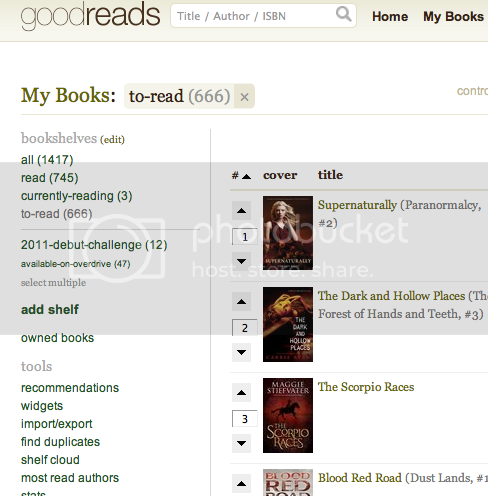 I have an evil number of books to read on my list. Yup. That's pretty evil, all right. LOL!!! I thought my TBR list was bad with over 300. It is amazing how fast the list can grow. There's too much good stuff out there! Ha, I know, I totally lol'd when I saw it. Normally, I only thin down once a year - but maybe I'll do a mid-year culling. Well, I do a lot of reading. And about once a year, I cull the list. So, I know between reading and giving up on, I'll eliminate about 300 a year. The other solution, of course, is to make sure I add more books to the list! Does a thousand books sound like too much?